Auditions are closed for this play. •Headshots and resumes are very helpful but not required for audition. JAKE - late 40s early 50s, suffers from psychosis; has imaginary conversations. He is a writer living in NYC dealing with a midlife crisis and a crumbling marriage. He can be witty and charming but lives life as an observer and fears intimacy. MAGGIE - Jake’s wife, late 30s to 40s, strong; independent; brutally honest. She is matter-of-fact, a career-oriented woman who loves Jake deeply but cannot deal with his inability to communicate with her as a real person. She exists in “real time” as well as in Jake’s imagination. KAREN - Jake’s sister, 40s, sarcastic; always on Jake’s back, opinionated. Biting and cynical – but witty. Her own divorce keeps her fired up. Only appears in Jake’s imagination. MOLLY (at 12) - Jake’s daughter. She appears from the past. In his mind, she is the perfect, loving, non-problematic kid. MOLLY (at 21) - Jake’s daughter. His daughter with Julie, she appears in present. She loves and supports her father and wants him to be happy with Maggie. She longs to know more about her mother and searching for more understanding. JULIE - Jake’s deceased wife, early 20s and 35. She serves as the ideal woman for Jake. She appears via Jake’s mind and complicates matters when she refuses to play her part. SHEILA - Jake’s potential third wife, early 30s. Her fun-loving nature is threatened by Jake’s crumbling sense of reality. She is a business woman who cannot cope with his indecision as the Maggie in his mind takes over his relationship with her. 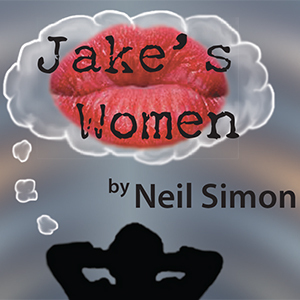 The play centers on Jake, a writer struggling to save his marriage and on the verge of a nervous breakdown. In bouts of daydreams and psychosis he carries on conversations in his mind with the women in his past and present. His wildly comic and sometimes moving flashbacks, fantasies and delusions are frequently interrupted by visitations from the women in the real world. The women include his first wife who died years earlier, his daughter in the past and present, his sister, his analyst, his current wife and his future prospective wife. Jake ends up trying to deal with his illusions at the same time he is carrying on with the real women - while desperately trying to avoid having the appearance of someone who has completely lost his mind. Jake and his women are a delightfully funny crowd!